I have long been intrigued by adoption, especially transracial adoption, so when I saw Nicole Chung’s memoir advertised last year, I knew I had to read it. All You Can Ever Know is Nicole’s story of her own adoption by white parents in the early 1980s. She grew up the only Korean in her small Oregon town and had to deal with some racist bullying growing up. But when she gets pregnant, she decides to learn more about her birth family. This is a story about adoption, family, motherhood, and second chances. Nicole Chung was born premature to Korean immigrants in Seattle and because her birth parents decided it would be best if they gave the baby up for adoption, she was adopted by a white family from a small Oregon town. Growing up, she knew she was different than any of her other classmates, but she was very loved by her family. Like many adopted children, Nicole asked her parents about her birth family, but they didn’t have very many answers and were not ready to reach out to establish contact. When Nicole got to college, she purposefully chose a school that had a large Asian population, so she wouldn’t feel so isolated. And even though she loved her family, after college, she and her husband moved to the other side of the country, partly because of her husband’s graduate school, but also to get away from the small Oregon town she grew up in. I can only imagine how difficult adoption is for children, especially transracial adoptees. As Nicole gets married and becomes pregnant, she is much more interested in finding out about her birth family, wanting to first know about her family medical history, but also what made them decide to give her up for adoption. The story that follows will break your heart, but also put it back together again. Nicole’s birth parents had their fair share of issues and ended up divorcing. But Nicole found out that she had two sisters and began corresponding with her sister Cindy frequently. The relationship between Cindy and Nicole was one of my favorite parts of the book. Despite not knowing each other for almost three decades, the two have ended up being very close. I appreciated this frank memoir about adoption; so many times white families adopt children of other races and do not do a good enough job reminding the children of their own culture and heritage. Nicole mentioned several times throughout the book that she did not know anything about her Korean culture until much later in life. This reminded me briefly of Celeste Ng’s Little Fires Everywhere. I am sure there are plenty of families out there who are raising their adopted children with as much knowledge about their own cultures and heritages, but it is easy to remember that twenty years ago or more, that was not always the case. I also really enjoyed Nicole’s realization that though her birth parents were not people she would get along with well, she found her family and was able to have some peace of mind. I also appreciated how supportive her parents were of her decision to search for her birth family; I am sure that was difficult for them, but they knew how important it was to Nicole. 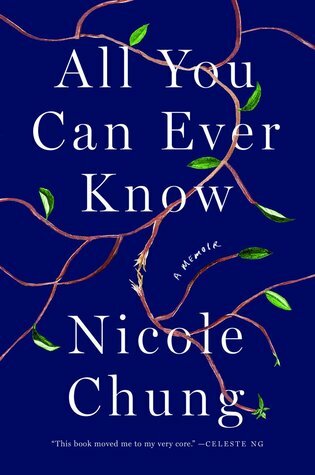 If you are looking for a moving memoir, I cannot recommend Nicole Chung’s All You Can Ever Know enough. I was moved to tears several times throughout the book, but came away with a deeper understanding and appreciation for families who adopt and the journey for the birth families. I give this 4 stars. What other memoirs have you read and enjoyed this year?